Marietta Blau. Image credit: Agnes Rodhe. Part 3/6 of a timeline of pioneering female scientists and mathematicians, juxtaposed with a timeline of human rights. This part contains women born from 1868-1896 including Annie Russell Maunder, Lise Meitner, Emmy Noether, and Marietta Blau. Maunder earned her degree at the University of Cambridge in 1889, graduating as the top mathematician in her college, although she did not actually receive her degree because the University did not give degrees to women at the time. Maunder began working as a ‘computer’ for Greenwich Royal Observatory in 1891, where she worked on observations of the Sun. It was there that she met Walter Maunder, who she married in 1895. Annie Maunder lost her job due to the marriage, but continued to work with Walter in an unofficial capacity. The Maunder’s most famous work showed a direct correlation between the number of sunspots and the climate of the Earth. They showed that the Maunder Minimum - a period between about 1645 and 1715 when sunspots became exceedingly rare - resulted in what’s now known as the ‘Little Ice Age’. Maunder travelled to India to photograph the Sun’s outer solar corona in 1898, and became the first woman to be elected to the Royal Astronomical Society in 1916. 1870 - In Britain, married women could own property. 1876 - In Britain, universities opened to women. Brooks gained a bachelor’s degree in mathematics from McGill University in Quebec in 1898. She stayed on to study for her master’s degree, becoming physicist Ernest Rutherford’s first graduate student. Brooks became the first woman to receive a master’s degree from the University in 1901. After this, she carried on working under Rutherford, and briefly under Marie Sklodowska-Curie. Brooks discovered the ‘recoil of the radioactive atom’. She was also one of the first people to discover radon and to try to determine its atomic weight. Rutherford described Brooks as being as apt as Curie; however, she lost her job after getting married in 1907. 1878 - In Britain, women who divorce on the grounds of abuse could claim custody of their children. Meitner became the second woman to obtain a PhD in physics at the University of Vienna in 1905. After this, she moved to Berlin to study under physicist Max Planck, soon becoming his assistant. During this time, she also worked with chemist Otto Hahn, researching beta radiation. In 1912, Meitner and Hahn moved to the Kaiser-Wilhelm-Institut (KWI) near Berlin. In 1917, Meitner and Hahn discovered the first long-lived isotope of the element protactinium and in 1922, Meitner discovered the Auger emission process. The Auger effect describes how, when the inner-shell of an atom is filled by an electron, a photon or another electron is emitted. This effect is named after French physicist Pierre Auger who made the same discovery as Meitner independently, the following year. Lise Meitner was part of the group that first ‘split the atom’. Image credit: Wiki Commons/Public domain. Meitner became the first woman in Germany to become a full Professor of Physics in 1926, while at the University of Berlin. She began working with American physicist Leo Szilard in 1930. After the discovery of the neutron in 1932, physicists realised that it might be possible to create new elements by adding neutrons to the heaviest known element, uranium. A race to create the first new element ensued between Meitner and Hahn, and Ernest Rutherford, Irène Joliot-Curie, and Enrico Fermi. Meitner escaped Nazi Germany for the Netherlands in July 1938 - with the help of Dutch physicists Dirk Coster and Adriaan Fokker - leaving all of her possessions behind. Meitner travelled from the Netherlands to Sweden, to work at physicist Manne Siegbahn’s laboratory in Stockholm, where she briefly worked with physicist Niels Bohr. Meitner reunited with Hahn in November of that year, in Copenhagen. There they discussed experiments that Hahn and fellow German chemist Fritz Strassmann could perform in Berlin. In December, Strassmann conducted the experiment that provided evidence for nuclear fission, but neither Strassmann nor Hahn recognised this. It was Meitner and her collaborator, and nephew, Austrian-British physicist Otto Robert Frisch, who analysed the results and showed that there was no other explanation. Meitner and Frisch explained how the nucleus of an atom could be split into smaller parts, and why there are no stable elements in nature beyond uranium. By the end of 1938, Meitner was the first to realise that Einstein’s theory of special relativity explained why a tremendous amount of energy was released during fission. Hahn and Strassman published their results in 1939. Szilard had already suggested the possibility of a chain reaction, which could result in a massive explosion. The realisation that this knowledge was in German hands led to the formation of the Manhattan Project. Szilard, Frisch, and Hahn were all involved in the Manhattan Project. Meitner refused an offer to work on the project and stayed in Sweden. After the War, Meitner criticised Hahn, Heisenberg, and other German scientists for staying in Nazi Germany for as long as they did, offering only passive resistance against the regime. In November 1945, it was announced that Hahn had been awarded the 1944 Nobel Prize in Chemistry for the discovery of nuclear fission. Meitner was nominated to receive the Nobel Prize three times, she won a number of other awards and medals, and has a number of buildings named after her, as well as the element meitnerium, craters on the Moon and Venus, and an asteroid. 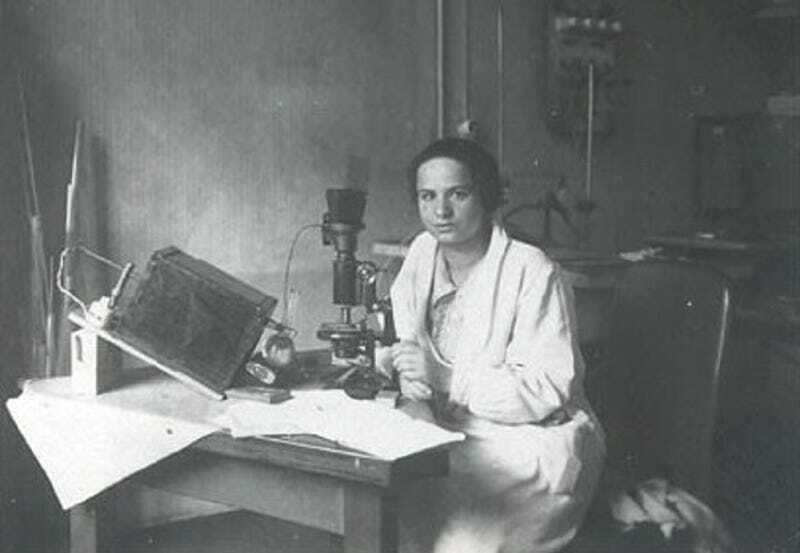 Gleditsch began her career as an assistant to Marie Sklodowska-Curie, and became a pioneer of radiochemistry. Gleditsch was the first person to successfully establish the half-life of radium, and helped prove the existence of isotopes. She later became a Professor at the University of Oslo. Noether studied for her bachelor’s degree in mathematics at the University of Erlangen between 1900 and 1902. Women were not officially allowed to study at German Universities at the time, and she had to ask each Professor for permission to take his course. In 1903, she transferred to the University of Gottingen where she attended lectures by mathematicians David Hilbert, Felix Klein, and Hermann Minkowski. Noether graduated in 1904, the same year that the University of Erlangen allowed women to enrol, and so she moved there to complete her PhD in 1907, working under Paul Gordan. After completing her PhD, Noether stayed on at the University of Erlangen, unofficially and without pay, since the University did not yet employ female faculty members. Emmy Noether proved the relationship between symmetries and conservation laws. Image credit: Wiki Commons/Public domain. In 1915, Hilbert and Klein persuaded Noether to return to the University of Gottingen, working freely while they tried to secure her an official post. This was not granted until 1919, and until then Noether’s lectures were officially recorded as Hilbert’s where Noether was recorded as the assistant. Noether developed what would later be known as ‘Noether’s Theorem’ while working at the University of Gottingen in 1915. Noether’s Theorem proves the relationship between symmetries and conservation laws in physics. This had important consequences for quantum mechanics, and led to the formulations of several concepts in Einstein’s theory of general relativity. Noether began working on abstract algebra in 1920, making a number of important breakthroughs. The University of Gottingen began paying her a small salary in 1923. Noether was dismissed from the University when Hitler came to power in 1933 because she was Jewish, although she continued teaching for free from her own home. Noether moved to the United States in 1934, working first at Bryn Mawr College in Pennsylvania, and then at the Institute for Advanced Study in Princeton. Lehmann studied mathematics at the University of Copenhagen and the University of Cambridge. In 1928, Lehmann became head of the Department of Seismology at the Geodetical Institute of Denmark. She was the first to explain the arrival times of P waves, and in 1936, she discovered that the Earth has a solid inner core beneath its liquid outer core. Haynes received her bachelor’s degree in mathematics from Smith College in Massachusetts in 1914, and her master’s degree from the University of Chicago in 1930. She gained her PhD from the Catholic University of America in Washington DC in 1943. This made her the first black American woman, and the ninth black American person, to receive a PhD in mathematics. Haynes taught for almost 50 years, working as a Professor of Mathematics at the District of Columbia Teachers College and at Miner Teachers College, where she established the mathematics department. She was the first woman to chair the D.C. School Board, and was active in abolishing laws that discriminated against women and people of colour. Quimby earned a degree in mathematics and physics in from Whitman College in Washington, and earned her master’s degree from the University of California in 1916. In 1919, Quimby began working at the Memorial Hospital for Cancer and Allied Diseases, where she pioneered nuclear medicine. Quimby became an Assistant Professor of Radiology at Cornell University Medical College in 1941. She became a full Professor in 1954, the same year she was elected president of the American Radium Society. 1893 - In New Zealand, women were allowed to vote. 1894 - In Britain, married women were allowed to vote in local elections. Wrinch completed a degree in mathematics at the University of Cambridge in 1916. She then continued for an extra year in order to study logic with mathematician Bertrand Russell. Wrinch went on to publish papers on mathematics and the philosophy of science. She also co-wrote a number of articles with mathematician Harold Jeffreys, which he described as forming “the basis of all [his] later work on scientific inference”. Wrinch went on to develop a model of a protein structure, which she called the ‘cyclol’ structure. This was a precursor to the DNA double helix. Blau gained a PhD in physics from the University of Vienna in 1919. From 1923, she worked as an unpaid scientist at the Institute for Radium Research in Vienna. Blau went on to develop the first photographic plates that could accurately image high-energy nuclear particles, and showed how you could determine their energy from the tracks on the plate. These were used in cloud chambers, bubble chambers, and wire chambers, devices that were fundamental to the development of particle physics. In 1937, Blau and her former student, fellow female physicist Hertha Wambacher, discovered star-like shapes in photographic plates that had been taken to an altitude of over 2 km. These were shown to be the tracks of cosmic rays. Blau was of Jewish descent, and so was forced to leave Austria in 1938. Albert Einstein helped her obtain a job teaching physics in Mexico City, and she moved to the United States in 1944. Erwin Schrödinger nominated her for the 1950 Nobel Prize in Physics for her pioneering work on photographic plates, but she lost to Cecil Powell, who had been inspired by her work. Blau returned to Austria in 1960, and worked for the Institute for Radium Research, without pay, until 1964, when she was appointed head of a group analysing the tracks of particles created in experiments at CERN. Part 4 coming soon! (Assuming people keep reading. Though I would like to carry on, there are so many more stories to tell and I will get back to posts about aliens after).